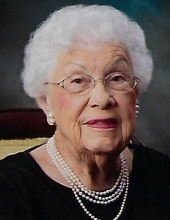 Elizabeth H. Robertson, 102, of Florence, SC, passed away peacefully on Thursday, February 7, 2019, at the McLeod Hospice House. She was born in Browns Summit, North Carolina, a daughter of the late William Thomas and Earla Mae Maxwell Hudson. In addition to her parents, she is predeceased by her husband, Golden T. Robertson; a brother, Willie Vance Hudson, and a sister, Katy Ozment. Mrs. Robertson worked for 25 years in the garment industry during WWII and became one of the first trainers within the company. She volunteered with a hospital in Eatonton, GA and at Carolinas Hospital here in Florence for over 20 years. She finally retired when she was 100 years old. She was a member of Pisgah United Methodist Church. Surviving are her daughter, Carolyn Richey of Florence; son, Ty Robertson of Bangor, ME; four grandchildren, Dr. Yvette Robinson of Farmington, ME, Dr. Monique Sullivan of Standish, ME, Dr. Nichole Goodspeed of Wilton, ME and Ben Robertson of Arvada, CO; sister, Louise Washkevich of Jacksonville, NC; nine great grandchildren; two step-grandsons, 1st SGT. Sean Richey of Fort Bliss, TX and Kelley Richey of Belleville, IL; and three nephews and five nieces. A funeral service will be held at 2:00 PM on Monday, February 11, 2019, in the Cain Calcutt Funeral Home chapel. The family will receive friends one hour prior to the service at the funeral home. A graveside service directed by Vining Ivy Hill Chapel will take place at 3:00 PM on Tuesday, February 12, 2019, at Eatonton Memorial Park in Eatonton, GA. The family would like to issue special thanks to MSA Hospice and her special nurse, Elizabeth, to the Helping Hearts, and to Marlow McCutcheon, for all of their special care given to Mrs. Robertson. In lieu of flowers, memorials may be made to Pisgah United Methodist Church or to the McLeod Hospice House. To send flowers or a remembrance gift to the family of Elizabeth Robertson, please visit our Tribute Store. "Email Address" would like to share the life celebration of Elizabeth Robertson. Click on the "link" to go to share a favorite memory or leave a condolence message for the family.